Millbrook Press (Lerner), Minneapolis, 2014. 64 pages. Shades of Indiana Jones! Here’s a nonfiction book about modern archaeology, complete with danger, religious artifacts, wall murals, ancient manuscripts, and plenty of human remains. In the Mustang region of Nepal, nestled high in the Himalayas near Mount Everest, high in the soft stone of the cliffs are thousands of caves, where ancient people used to make their homes, probably to escape fighting over the Silk Road. This book details recent expeditions to explore the caves. Pete Athans, American world-class mountain climber, led the expedition, and brought along his wife Liesl Clark, who is also a world-class mountain climber, and their two children. The children have set a record as the youngest outsiders to enter the district of Mustang. Pete Athans’ sister is the author of the book. Pete Athans has climbed Mount Everest, but the Mustang cliffs, with their brittle rock faces, are perhaps even more dangerous. The photographs in the book are many and varied. The story of the exploration is fascinating as they had to use mountain-climbing techniques to uncover these cave cities – and then found artifacts like an ancient mural, thousands of pages of an old manuscript, ancient pottery, and even human and animal remains. Scientists study the different artifacts in different ways, and for each step, permission was needed from the government of Nepal. A scholar who could read ancient Tibetan was needed for the manuscripts. A geneticist who can extract DNA was needed for the human remains. And of course archaeologists are involved in uncovering the rich artifacts buried in the tombs. And all the scientists have to learn rock climbing to access the finds. This book is sure to get kids interested in archaeology, as well as the many other areas of science involved in learning about the ancient past. Or perhaps exploration and rock-climbing. Sonderling Sunday – For Kristen! It’s Sonderling Sunday, that time of the week when I play with language by looking at the German translation of children’s books! This week’s installment is dedicated to my niece, Kristen, who recently learned that she gets to spend her Sophomore year of college in Heidelberg, Germany! 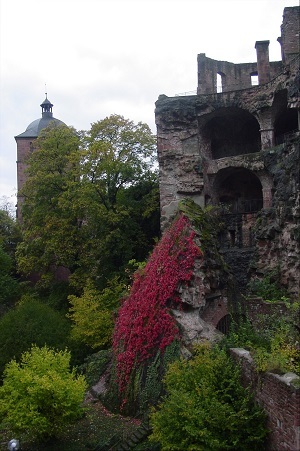 During my ten years living in Germany, we were only about 30-45 minutes from Heidelberg, and it was one of my favorite places to bring visitors. I hope I’ll get the chance to go visit Kristen while she’s there! And now for Sonderling Sunday. This week, I was asked to step in at the last minute to be a Cybils panelist for first-round Middle Grade Speculative Fiction! What this means is that I probably shouldn’t spend much time on Sonderling Sunday until after the end of the year — I should be reading! (And I *love* that I can legitimately say “I should be reading.”) However, it’s been a long time since I posted, and last week, I spent an hour on a post — and then lost it in a fluke (I hope) WordPress accident. When it got to where it was taking me as long to try to recover it as it would to rewrite it, I decided to stop. But it’s still eating at me that I want that section done! For Kristen — I like to think of Sonderling Sunday as a sort of phrasebook, with translations you won’t find in ordinary phrasebooks, but which are clearly useful, since they have been used in a children’s book, for goodness’ sake! 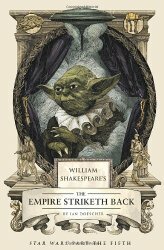 This week (and last week), I’m back to Der Orden der Seltsamen Sonderlinge, The Order of Odd-fish, by the illustrious James Kennedy, whom, it turns out, also knows a lot about Star Wars. Last time — or anyway, the last time I managed to post — we left off on page 216 in the original English edition, and Seite 273 auf Deutsch. I have to start with the reply to the last line I posted. = Stricken? Ich werde dir gleich zeigen, wie man strickt! = Jo blieb zurück und strampelte im Wasser. — That one gains something in translation. = Jo begriff plötzlich, wie alles zusammenhängen musste. = Sie nahmen den längeren Weg nach Hause. HarperCollins, 2014. 5 ½ hours on 5 compact discs. I reviewed Freakonomics back in 2005. It presented a different way of looking at problems than common “wisdom” suggests. 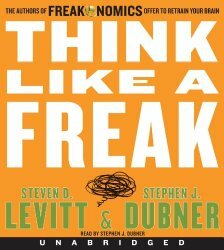 In this book, Think Like a Freak, the authors not only show you problems they have solved, but they offer tips and suggestions for how you can solve problems the Freakonomics way. As well as giving problem-solving tips, they also give you advice on persuading people who don’t want to be persuaded. One piece of advice is to tell stories. And this book abounds with stories and examples for every principle given. Even if you don’t take their advice, you’ll find the stories entertaining. But I’m guessing that you will also find them persuasive. For example, to go with the tip of having gardens weed themselves, we’re told why Nigerian scammers are actually smart to mention Nigeria. It weeds out all but the very most gullible people. In light of the principle that we should get rid of the idea that quitting is always bad, the authors tell about a huge experiment they ran, offering to make people’s decisions for them with a coin flip. Those are just a few of the entertaining and informative examples, which are presented in an engaging way and may get you looking at the world differently. Unlike many authors, this one’s voice is as mellifluous as an actor’s. I found myself looking forward to my commute to hear more of what he had to say. Random House, New York, 1965. 185 pages. In my rereading of childhood favorites, The Three Investigators series, I’m now on Book 3. The Whispering Mummy isn’t the greatest of the series. The plot seems quite far-fetched, going well into Scooby-Doo territory, with lots of seemingly supernatural occurrences that the reader is pretty sure are going to end up being someone’s evil plot. Once again, there’s another ethnic group that’s treated essentially as a stereotype, this time a Libyan boy and his uncle. Once again, rival Skinny Norris has a small part to play, but actually I like his part in this book. Jupiter uses the Ghost-to-Ghost Hookup, asking five friends to ask five friends about something, and thus blanketing the city. Even as a kid, I never believed in the Ghost-to-Ghost Hookup, because it doesn’t take into account that after awhile kids would run out of friends who hadn’t already been called. Kids don’t actually have a large number of social groups, and once most of the kids in their grade at their school are contacted, it doesn’t matter what you ask them to do, they wouldn’t be able to deliver. But in this case, Skinny finds out about the question being asked and foils their plans. I didn’t mind that, since even though it’s maybe unrealistic the question would have actually gotten to Skinny, at least it shows that Jupiter’s “brilliant” plan doesn’t always work smoothly. And overall? The book is still lots of fun. 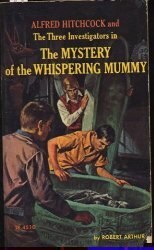 Three boys solving a mystery that baffles adults, including dangerous situations and mysterious phenomena and cool equipment (walkie-talkies!). Gleeps! If the plot wasn’t terribly believable, at least it was lots of fun. Source: This review is based on a library book gotten by interlibrary loan via Fairfax County Public Library. National Geographic, Washington, DC, 2014. 48 pages. Here’s a picture book biography of a scientist readers probably haven’t heard of, but whose work, which continues to the present day, is fascinating. Adrienne grew up interested in the natural world around her and also interested in Greek myths. As she studied Greek writings and Greek art over a course of years, she became convinced that the Greeks were basing their stories on things they had actually seen. 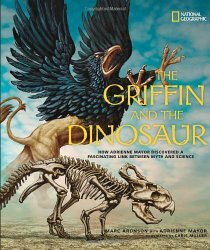 Adrienne’s decade-long quest to prove that the griffin legend was based on a real fossil always had a larger aim. She was certain that the peoples of the ancient world had been as attentive to fossils and bones as we are today. If the Cyclops was an extinct mammoth and the griffin was a Protoceratops, surely many other myths and legends were based on observation, not fantasy. Which ones? This book is an introduction to the topic that is sure to pull in readers. We’ve got Greek mythology and dinosaurs, combined. What could possibly have more kid appeal? Dial Books, 2013. 392 pages. 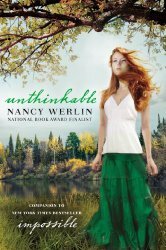 After I read Impossible, by Nancy Werlin, on the way to vacation in Oregon, I made sure I went to Powell’s books to find copies of Extraordinary and Unthinkable to read as well. So together they gave my vacation a memory of some Extraordinary reading time! Unthinkable is billed as a “Companion” to Impossible. And though technically you can read it without having read the others, it pulls together some threads from both Impossible and Extraordinary, so I’m happy with my choice to read them in order. In Impossible, we learned about the family curse on Lucy Scarborough and all of her female line right back to her ancestor, Fenella Scarborough, who rejected an Elfin Knight and then was cursed. Fenella also has been unable to die for all those centuries, having to watch each of her daughters and granddaughters be tormented in turn. When Lucy broke the family curse, she didn’t break the enchantment placed on Fenella. Now, Fenella just wants to be allowed to die. Fenella goes to the faerie queen, begging to be allowed to die. But it’s not so simple. There’s a spell upon her, cast by Padraig, the one who cursed her family. The queen figures out that to break the spell, Fenella needs to complete three tasks of deliberate destruction in the mortal realm. She warns Fenella that this will involve terrible choices, but Fenella doesn’t care. She commits herself to the tasks. And then Fenella learns that if she completes the tasks, not only will she again be mortal, but Padraig will die. If she fails? She will once again be Padraig’s slave. The cat butted his soft head against Fenella’s ankles. He did not make a sound, but Fenella heard his mocking voice in her head. “He told me –“ Fenella broke off. “He said that my family must be the target of each act of destruction. He said it would not be human destruction if there was no pain for me. For people I care about.” Her eyes were hot flame. “Tell me it’s not true,” she demanded. Fenella does join her living family. And she does come to love them. There is even a man she feels connected to. If she commits these acts of destruction, surely they will hate her. But if she doesn’t, starting the family’s curse again is truly unthinkable. I won’t give any details, but I was surprised by what a beautiful ending Nancy Werlin pulled off out of this terrible situation. As with the other books, the author did a marvelous job with the characters and relationships in this book. These people love one another, but they are caught up in an extraordinary and difficult situation. There’s even a hint of ways Fenella can work with the faerie realm in the future – I hope this means more books to come. Source: This review is based on a copy I purchased at Powell’s Books in Portland, Oregon. Random House, New York, 2014. 195 pages. I took my goldfish home and named it Goldie like every other kid in the world who thought they were being original. But it turned out that Goldie was kind of original. Even after all my classmates’ fish had gone to the great fishbowl in the sky, Goldie was still alive. Still alive when I started kindergarten. Still alive in first grade. Still alive in second grade and third and fourth. Then finally, last year in fifth grade, I went into the kitchen one morning and saw my fish floating upside down in the bowl. My mom groaned when I told her. “He didn’t last very long,” she said. “Unlucky thirteen,” she said with a wry look. “They were all unlucky,” I pointed out. We gave Goldie Thirteen a toilet-bowl funeral, and I asked my mom if we could get a dog. After this seemingly unrelated beginning, in the next chapter we learn that Ellie’s mother is going to be late coming home because of something to do with getting her grandfather from the police. When she does come home, she’s got a thirteen- or fourteen-year-old boy with her. He looks awfully familiar, and is very critical of her mom. Something about this whole exchange tickles at my memory. It’s like watching a movie I’ve already seen. I study the boy – the gray-tipped hair, the way he’s standing so comfortably in our hall, how his right hand opens and closes as if used to grasping something by habit. But it’s the heavy gold ring hanging loosely on his middle finger that draws my eye. It’s a school ring, like the kind you get in college, and it looks old and worn and has a red gem in the center. “I’ve seen that ring before,” I say, and then I remember whose hand I saw it on. Yes, Ellie’s grandpa Melvin is a scientist, and he’s discovered a “cure for aging.” He discovered a new kind of jellyfish that can actually revert its body to the polyp stage, it’s younger self. He made a compound with the specimen and tested it successfully on mice, reverting them to adolescents. Then, naturally, he tried it on himself, and the result is an apparently thirteen-year-old “cousin” living with them. 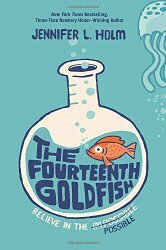 Melvin has a mission – to break into his lab and recover the jellyfish specimen. The security people there don’t believe he’s the same person as is shown on his badge. But living with his adult daughter and eleven-year-old granddaughter has some challenges. Ellie’s mom insists that he has to go to school, since he doesn’t want to get the police coming after them. As Ellie gets to know him, she finds the science he talks about more and more fascinating. And she’s happy to try to help him break into the lab. This book is a lot of fun, and presents a refreshing perspective on aging, science, and the generation gap. Without giving any specifics, I’ll say that I didn’t buy the ending, so that made it fall short of greatness for me. But I did like the way she interwove themes throughout the book, and I liked the look at how an old man would act if he suddenly became a teenager again. Alfred A. Knopf, New York, 2014. 36 pages. 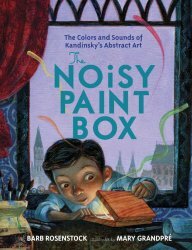 I love picture book biographies about artists where the illustrator communicates the feeling of the artist’s life and work. Mary Grandpré achieves this in The Noisy Paint Box, managing to do what Vasily Kandinsky was trying to do, and paint feelings. The words ring. A note at the back explains, “This book is historical fiction. The dialogue is imagined, although the events are true.” As long as Barb Rosenstock was inventing dialogue, she used words that make an impact. “Look what I made!” shouted Vasya. “Is it a house?” asked Auntie. “Is it a flower?” asked Mama. “What’s it supposed to be?” asked Papa. “It’s music!” said Vasya, waltzing his painting around the house. “Do some math!” said Papa. Later, when the adult Kadinsky creates abstract art, we see our first reproduction of one of his paintings with text that echoes his family in childhood. It took a long time for people to understand. In the note at the back, the author also explains that Kandinsky probably had synesthesia, since he described experiencing colors as sounds and sounds as colors throughout his life. Combined with the art of Mary Grandpré, even child readers will get a sense of what that means. HighBridge, 2014. 7 hours on 6 compact discs. After listening to the first CD of this audiobook, I was strongly tempted to quit. Put the whole book away. 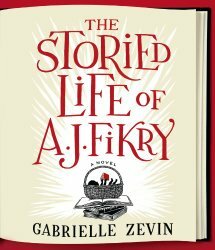 The book doesn’t even begin with A. J. Fikry. It begins with a woman who’s a publisher representative. She takes the difficult journey to Alice Island in Massachusetts to meet with the owner of Island Books. He hasn’t read his email and isn’t expecting her. In fact, he hadn’t realized that her predecessor is dead. He is curmudgeonly and terribly rude to her. After she leaves, we see him get out the rare book that he’s counting on to pay for retiring from the bookselling business. He drinks until he passes out and imagines his recently-killed wife helping him to bed. In the morning, his rare book, the one worth a fortune, is gone. The same policeman helps him who investigated his wife’s car accident. Depressing story, right? I wasn’t crazy about the reader, either. It wasn’t terribly easy to tell who was talking by the voice. But I continued into the second disc… and someone left a baby in the bookstore. The baby changes A. J.’s life. In good ways. And this book about A. J.’s life ends up being delightful. There are some dramatic plot twists thrown in. Perhaps the story isn’t entirely likely. But it has plenty of heart. We see A. J.’s daughter grow to be a teenager, with the story focusing in on different crucial times in their shared lives. She’s a girl who loves books and reading. They are my kind of people. By the end of the book, we’ve got a tribute to independent bookstores, and how they give a community its heart. You are currently browsing the Sonderbooks blog archives for October, 2014.